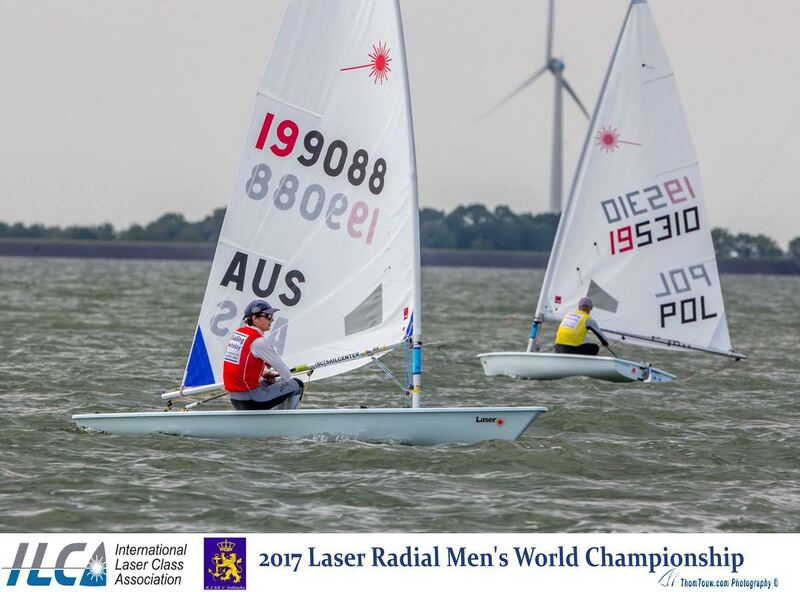 (Medemblik, Netherlands) – Today brought the first round of the Final Series at the Laser Radial World Championships. 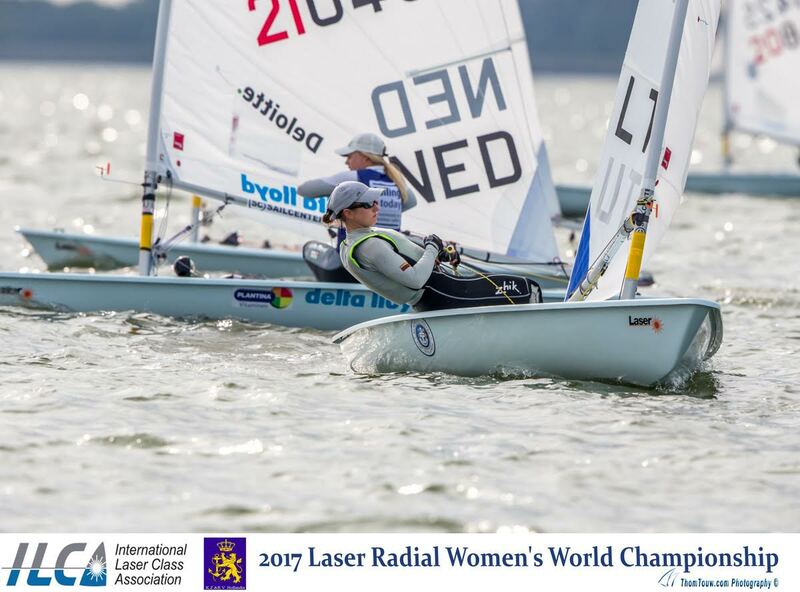 The fleets were divided into Gold and Silver in the women’s division based on results from the last four days of qualifying races. The morning began with postponement on shore while the breeze built to about 6-7 knots, for the sailors to head out on the IJsselmeer. The fleets arrived at the course only to watch the wind die out under an AP flag, and returned to shore. Finally, after a significant wind shift, the sailors were sent out again in a steady 7 knots to start the Final Series. In the Gold fleet, there was a reversal in the leaderboard as Marit Bouwmeester (NED) maintained her top 5 streak, while Evi Van Acker (BEL) finished 15th in the second race of the day. Daphne van der Vaart (NED) claimed Race 9 early on. She rounded every mark in first, with Brenda Bowskill and Sarah Douglas from Canada chasing her forward to the finish line. Bowskill took second and Douglas sailed into third, while Van Acker and Bouwmeester were battling for fourth place. Van Acker crossed just ahead of Bouwmeester. Race 10 showed a different leader after Viktorija Andrulyte (LTU) won the pin, and won every mark thereafter. Manami Doi (JPN) worked to protect second with Bouwmeester behind in third. The Silver fleet began Race 9 with a general recall and a black flag start. Lucia Falasca (ARG) found speed in the light wind today and remained at the front of the fleet around the course. Yumiko Tombe and Momoko Tada of Japan were in pursuit of Falasca through to the finish. Tombe took second and Tada claimed third. By Race 10 for the Silver fleet, the wind had slowly dropped to about 5 knots and it took off with a slow start. Again, Falasca was leading around the first upwind mark, but Zoe Thomson (AUS) managed to work her way past and sailed into first across the finish line. Hannah Van Goor (NED) sailed into second, with Ekaterina Zyuzina (RUS) behind in third. Bouwmeester sits on top overall in first with 22 points, after an impressive comeback from Day 1 where she scored 29th and 27th in the first two races of the regatta. “I woke up on the second day and recognized all of the things that needed to change,” Bouwmeester explained. “They had to be done, otherwise I might as well go home after Day 2. Today it was similar conditions, tricky, but we had the same game plan and it worked out really well today.” Van Acker has moved to second with 31 points, and Doi is in third with 40 points. 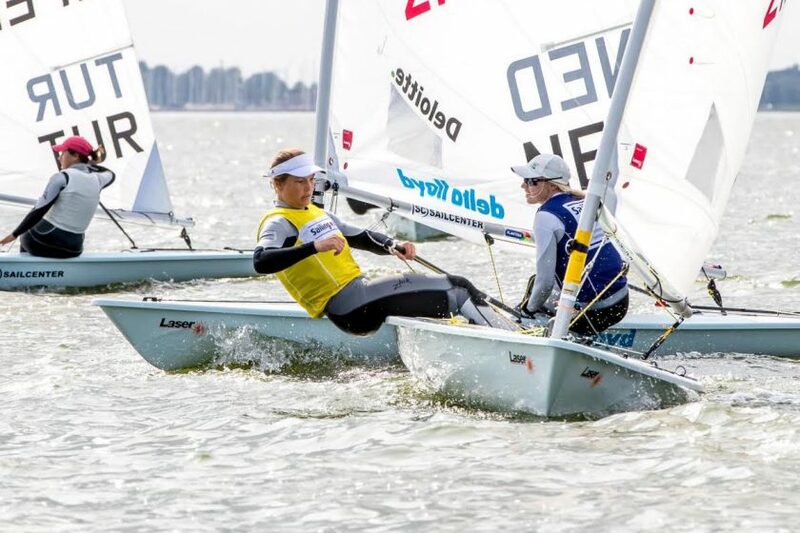 The Men’s fleet also set off on Race 9 after a general recall, and 16-year-old Zac Littlewood (AUS) continued yesterday’s remarkable performance and sailed into a comfortable lead ahead of the rest. Marcin Rudawski (POL) followed in second ahead of Jakub Halouzka (CZE) in third. Race 10 began after two general recalls and black flag starts, under which Littlewood was disqualified for the race. Edoardo Libri (ITA) rose to the top for the second race of the day, leading Eliot Merceron (SUI) and Calvin Gibbs (RSA) respectively to the finish. Overall, Rudawski still sits in first with 30 points, ahead of Merceron in second with 41 points, and Littlewood in third with 50 points. The final day of racing is tomorrow with two more races scheduled.